In other news – I got a teaching job! 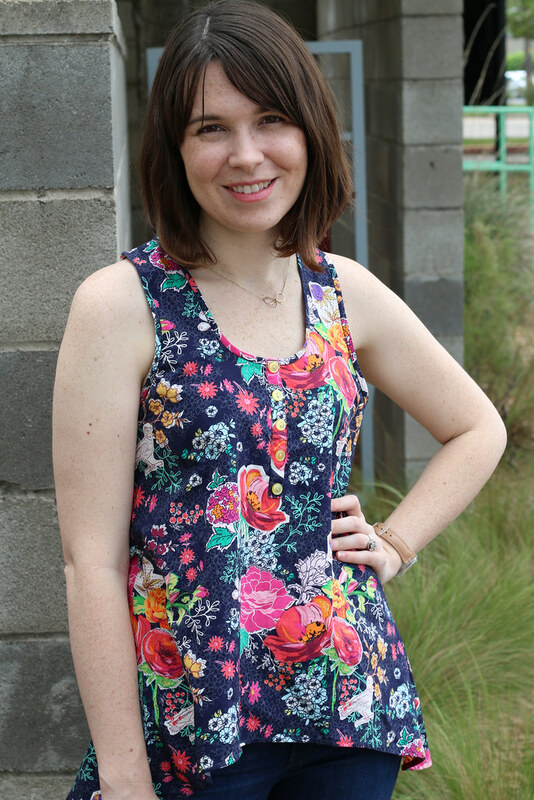 There’s a new fabric/yarn store in Austin called Me & Ewe that recently opened and I’m signed up to teach a beginner’s class and a class to make this tank top. This is my sample that I’ll use for my class. 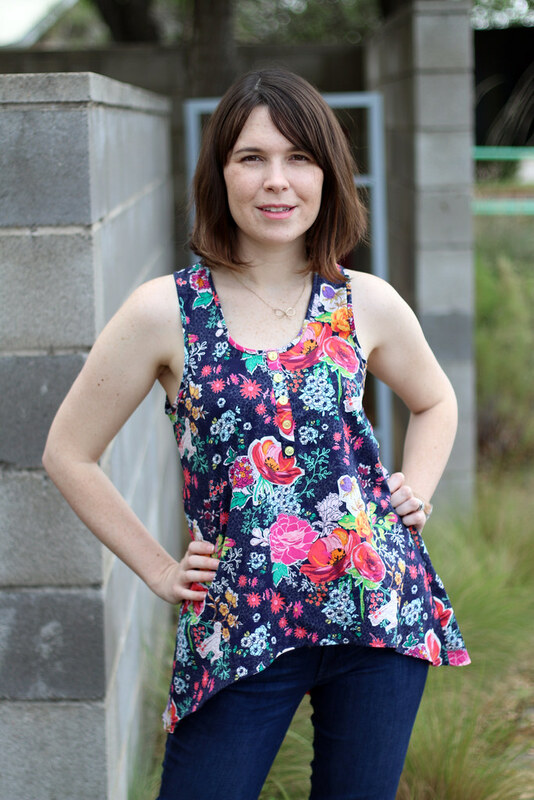 The Pattern: The Myla Tank by Sew Liberated. 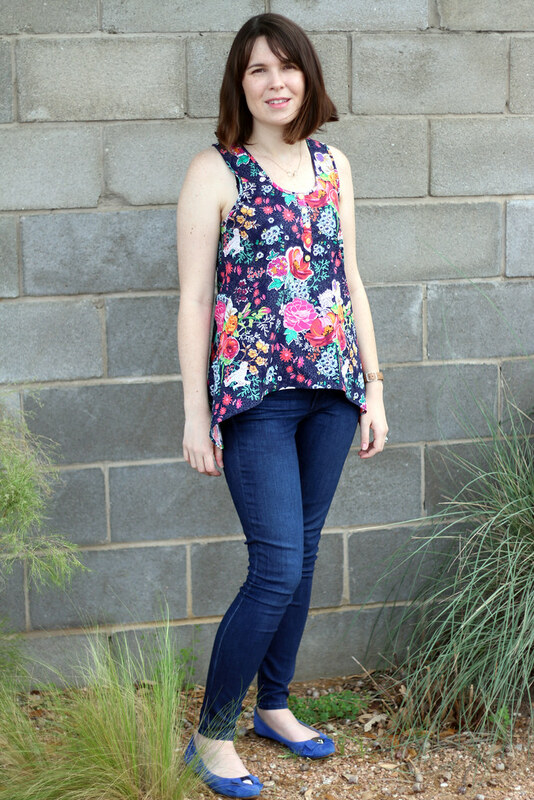 It’s a quick and easy shirt pattern with no darts (yay!) 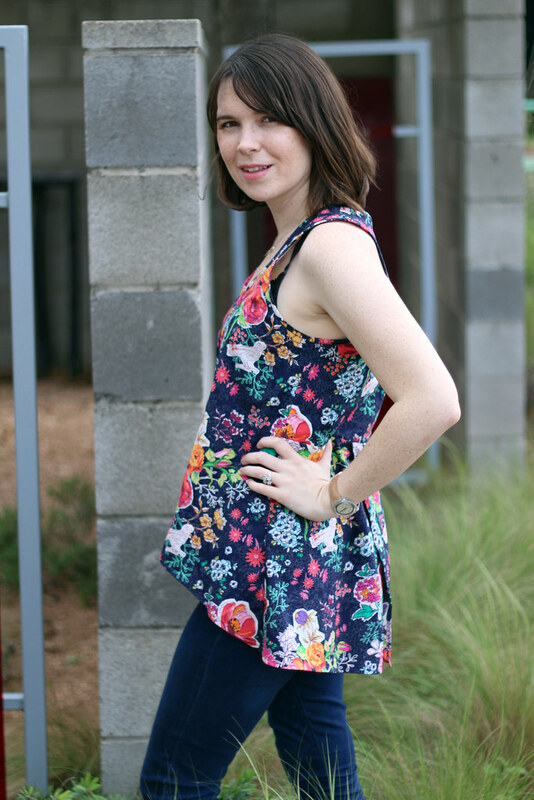 a curved hem with an overlapping split back, bias bound neck and armholes, and a faux button placket in front. The pattern uses French seams which I think is cool and might also be a neat technique to teach in my class. The Fabric: A Katy Jones for Art Gallery print that I of course got from Me & Ewe. The pattern calls for light fabrics like lawn or challis but while this is technically a quilting cotton Art Gallery’s fabrics are so thin and light that I thought this would still work and I think I was right. The yellow buttons are from my stash. The Changes: I made a size 6, if I remember correctly. 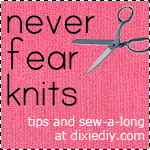 The only change I made was to the front armhole. I had some gaping there which I debated whether or not I should make a small armscye dart. I noticed looking on the envelope cover itself that the model has the same gaping that I had (on the model’s right side). 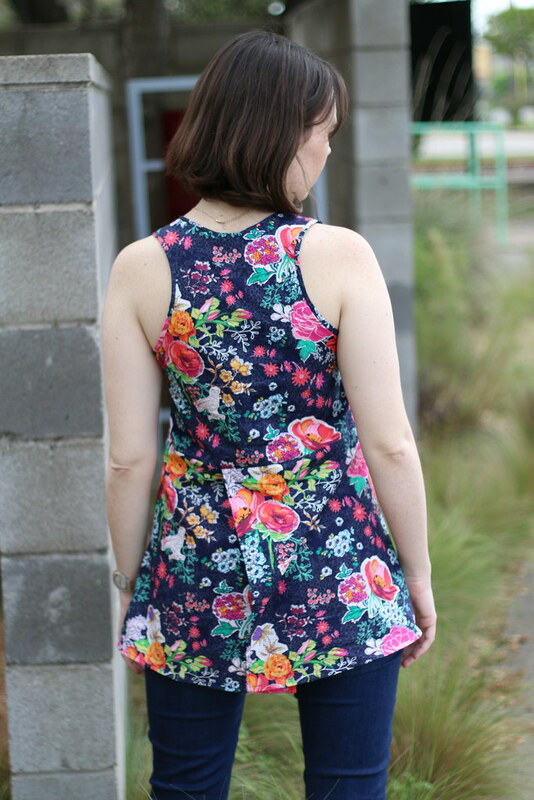 Even this alternate sample from Sew Liberated had the gaping, too. To fix it without altering the pattern I ran a length of basting stitches around the front armhole curve and pulled the ends ever so slightly to make almost unnoticeable gathers (sort of like when you ease a sleeve cap into the armhole). Then I bound the armhole to make the gathers permanent. Problem mostly solved! I know from experience that the larger the bust the more curvy that armhole needs to be so if I’m working with students with that feature I may have to do some pre-emptive fitting. If we make muslins we can dart out the gaping and open up the shirt at the bottom to rotate that ease away. The Results: I quite like this top. It was fast to put together. I like that the placket is fake because I am lazy. The split back makes it easy to sit down and bend over without the shirt getting caught on your bum (also good for those of us with larger backsides). The bra I’m wearing criss cross straps so you don’t see them in back. I don’t mind visible bra-straps on a racer-back shirt but what I do mind is side bra. I had to dig though my bra collection to find one that wouldn’t show so much in the armhole. You can still see a bit of side bra depending on how I stand, more so in the front than the back. I’m just going to have to accept that this tank has big armholes and that’s just how it’s gonna be. 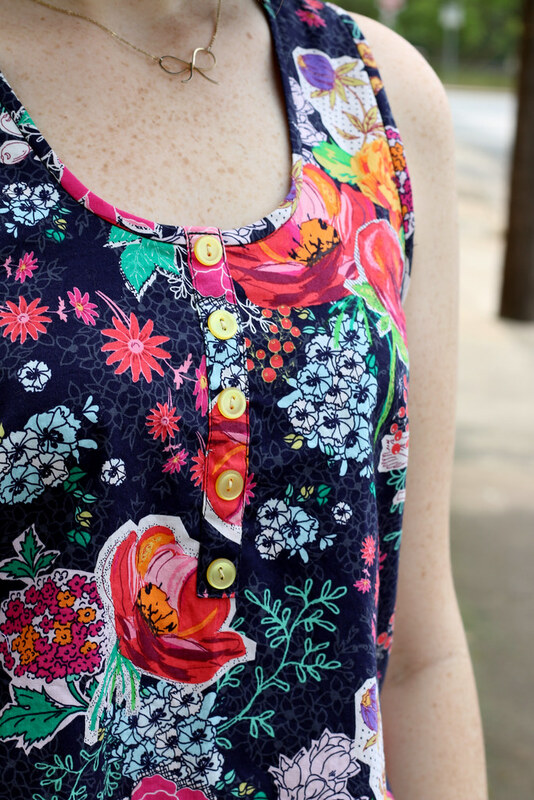 I’d probably redraw the front armhole entirely if I make this pattern again (maybe using the awesome Scout Tee armhole shape).